Hepatitis B and hepatitis C are important causes of chronic liver disease globally. 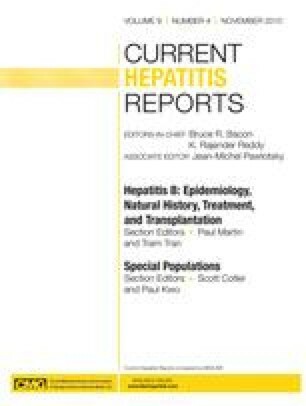 Although HBV/HCV coinfection is not uncommon, its epidemiology is poorly defined. Numerous studies provided evidence that coinfection accelerates liver disease progression and increases the risk of hepatocellular carcinoma. By applying new cell culture models to examine the interaction of both viruses, investigators concluded that HBV and HCV replicate in the same hepatocyte without interference. The roles of innate and adaptive immunity in determining the viral replication and disease outcomes still need rigorous investigation. To date, no standard-of-care recommendation exists for HBV/HCV coinfection. Pegylated interferon and ribavirin combination therapy demonstrated similar efficacy in suppressing HCV RNA in coinfection and HCV monoinfection. However, HBV reactivation during therapy can be a challenge. Future clinical trials evaluating the addition of a nucleoside/nucleotide analog for selective patients with HBV/HCV coinfection are essential for successful management of HBV/HCV coinfection. The author has served on advisory boards for, and received research grants, honoraria, and travel reimbursements from, Bristol-Myers Squibb and Gilead.